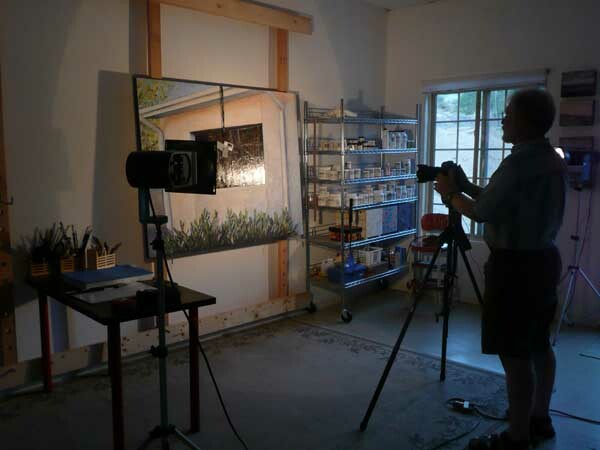 At last...making art full-time: What Comes Next After the Painting is Done? What Comes Next After the Painting is Done? Before a painting ever leaves my studio, I make sure to have photographs taken. Luckily, since I'm married to a professional photographer, this is easily accomplished. I just have to be sure to give Jim enough time to fit this job into his schedule. He'll do this for other artist's, too, only he charges a fee. Here is Jim, checking the color balance. That why there are dangling items hanging from a string over the painting. I have no idea of the technicalities of all this (note the poor quality of all of the photographs I've taken for the blog! ), but I do know it's critical. Lighting equipment helps to control things. Here, Jim is testing the lighting and the color balance. He works until everything is just right. With digital photos, he's pretty sure when he has what he needs. The next step is to download the images to the computer. He does more color correcting at this stage of the game, too. If all is well, he is done his part of the job. At this point, I transfer the photos into my computer. Isn't it all magic? At least if everything goes well and I don't do something stupid! From there, I organize the photos and put them into Bento, a program I use for keeping track of my work. Then, I add the new painting images onto my website. 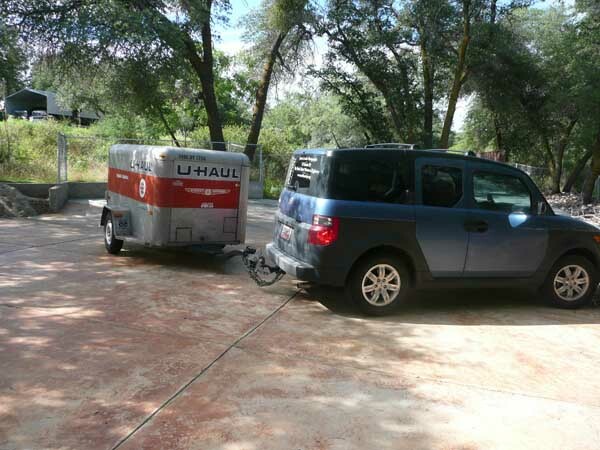 Ah, ha, here's the little UHaul I rented to transport my paintings. All set to load up. 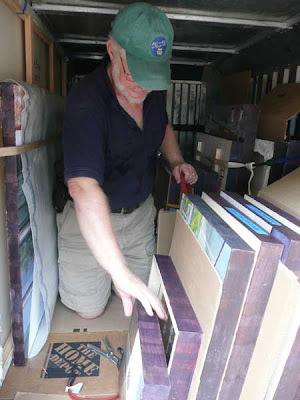 Jim is carefully stacking the paintings. 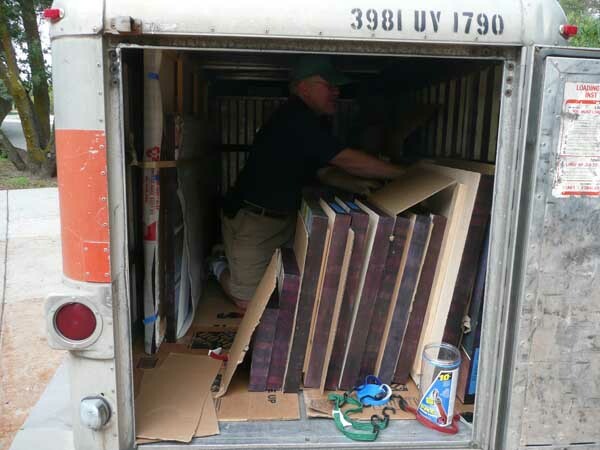 Next comes tying the paintings down with lots of bungee cords. Don't want them damaged in transit. After arriving in Phoenix after a two hour drive, we unloaded the paintings. 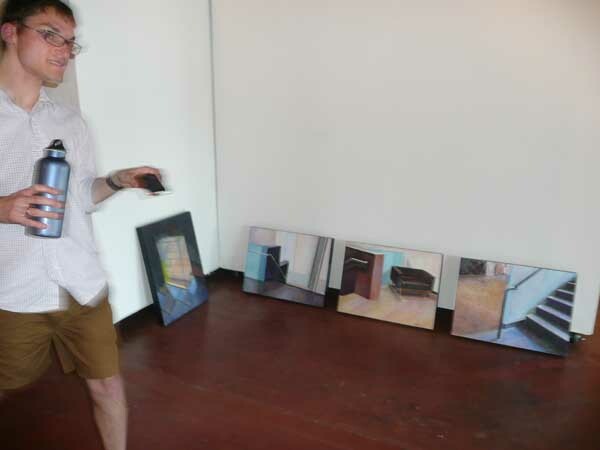 Son, Mathew, is rushing about (hence the blur), rehydrating himself after moving the paintings from the 110° outdoors into the cool gallery. They are randomly placed around the wall space to start with. 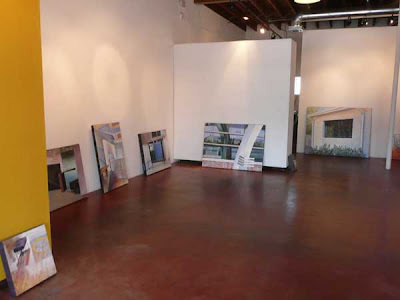 What you aren't seeing here is all of the work the went into getting the gallery ready for my work. 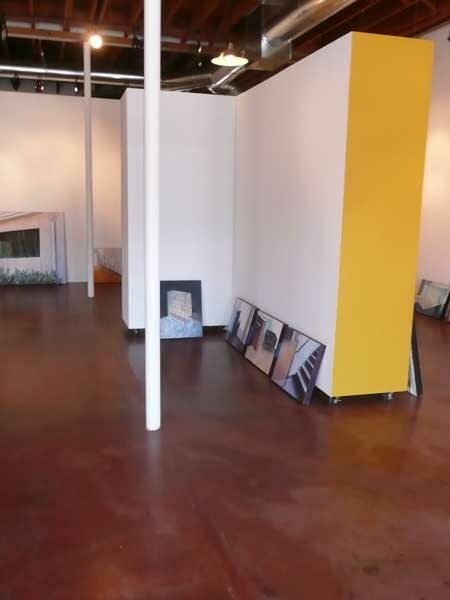 First, the previous show had to be taken down and the art work needed to be picked up by either the new owner or the artist. Next, the walls were moved around to create a space especially for suitable for the new show. Holes had to be spackled. Walls needed to be painted. The yellow was chosen, because it complements the colors I use in my paintings. All of this was done with great care by a group of artists who volunteered their weekend to do the job. Here's another view of the space. It's a beautiful gallery. Polished concrete floors, high ceilings, great lighting. It even has a bathroom and a kitchen. Deluxe! 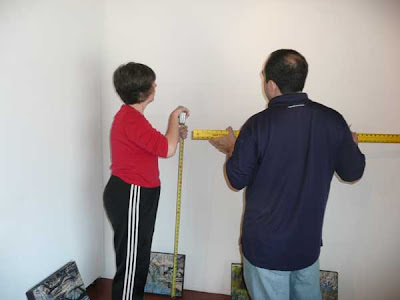 After much moving of paintings to see what fit where and what looks good with what, the show was ready to put on the wall. 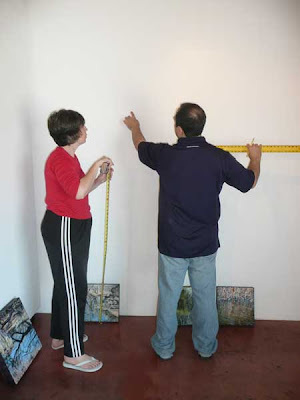 My heroes, Patricia Sahertian and Todd Daniel are discussing their strategy for hanging the art work. They are a meticulous pair. The mathematics was beyond me. My job was to write down numbers on a little pad of paper. Actually, I do know how to do all of this, but am usually too lazy. They are deciding on the spacing and height. 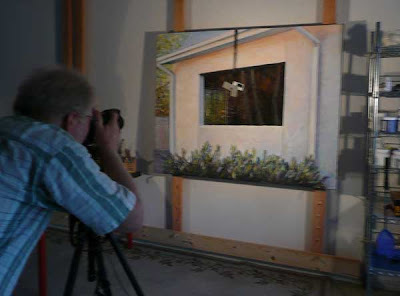 Figuring out how far the wire is from the top of the painting. This is the last step before actually pounding the nail into the wall. Getting everything just right is a lot of effort, both physically and mentally. And it takes lots of time and patience. Thank you to Patricia and Todd for the beautiful installation. Both are artists with limited time to make their own work, making the time they spent even more appreciated. Stay tuned for pictures of the August First Friday reception. Where Oh Where Has Barbara Been?